Nissan’s trendy new five-door Micra is set to shake-up the light car market with its combinations of unusual looks and impressive value for money. Quite unlike anything else on the road, Nissan’s Micra is the model that brings a distinctively different and undeniably different look to the city car market. With a zippy and economical 1.4-litre engine matched to a standard four-speed automatic the new five-door Micra competes in the light car segment with a remarkable entry price of just $14,990* (RRP). Packed with features, the Micra comes standard with air-conditioning, driver and front passenger airbags, anti-lock brakes, front active headrestraints, power windows, power mirrors, central locking with keyless entry, MP3 compatible single in-dash CD player and 60/40 split folding rear seat. 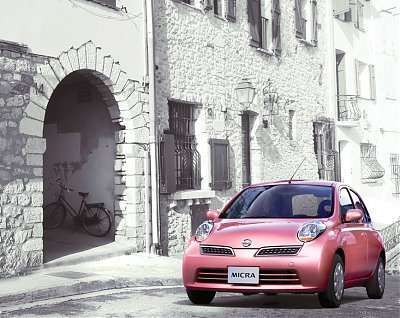 One option pack is available – the $1,700 (RRP) Micra City Collection. The Micra City Collection includes dual front side airbags and dual curtain airbags, teamed with a MP3 compatible 6-stack CD player and 15-inch alloy wheels. The 1.4-litre four-cylinder engine produces 72 kW at 5,600 rpm and 137 Nm of torque at 3,200 rpm providing punchy performance and remarkable economy. The all-aluminium, 16-valve twin cam engine feature Nissan’s Variable Valve Timing control system and a ‘Drive-by-Wire’ electronic throttle, while extensive use of low friction moving parts and lightweight pistons improve not only the levels of NVH (noise, vibration and harshness) but also fuel consumption. The standard advanced, electronically controlled four-speed automatic with extended slip lock-up control offers smoothness, economy and above all response, in keeping with Micra’s fun to drive philosophy. Helping the new Micra stand out from the crowd is its dramatic yet chic styling which is complimented by a bold choice of complementary colours, including great new additions to the Nissan range such as Paris Blue, London Rose and Vienna Garnet. A truly distinctive style marks the new Micra out as something different. The design language involves the use of well defined volumes and arched lines, resulting in a reassuring and cosy car. Principle ‘arch’ design cues include a dominant shoulder line which is echoed in the Micra’s rounded roofline. The high roof means passengers sit in a more upright position which not only improves comfort but also permits greater luggage space. The driver also benefits from a high driving position for greater visibility. Short body overhangs front and rear and high mounted ovoid headlamps with a clever illuminated ‘bubble’ combined with the Micra’s class-leading turning circle of just 8.8 metres, the Micra is as user friendly on the road as it is in the cabin. Micra also has speed sensitive electric power steering designed to offer maximum assistance at parking speeds but which gradually decreases as speeds rise to give greater steering feel. It provides a highly responsive car that is agile in city driving and stable for open road cruising. Central to the Micra’s ethos is its easy and fun to drive nature – which means crisp and nimble handling, best manoeuvrability and good levels of comfort and quietness. A key element in achieving this is the Micra’s B-platform, designed jointly with alliance partner Renault, and which delivers a class-leading chassis in the most cost-effective way possible. The front suspension features a sub-frame mounted strut-type system with combined suspension upright/coil spring assemblies and a forward lower link. The front anti-roll bar is attached directly to the strut assembly for more effective control of body roll under cornering. The sub-frame itself uses compliant rubber mounts to isolate road noise and vibration from the platform itself, improving both general refinement and ride comfort. At the rear, is a twist beam suspension system with trailing arm location and separate coil springs and damper units. The beam design and the location of the damper units reduce friction in the rear suspension system to enhance ride comfort. Nissan’s marketing general manager, Ross Booth, believes the Micra is the perfect car for the city market. “The Nissan Micra not only stands out from the crowd but its funky looks, great driving characteristics and incredible packaging give it the edge over its nearest competitors,” said Mr Booth. *All prices quoted are recommended retail pricing and do not include metallic paint, dealer delivery and on-road costs, such as state/territory charges and taxes.